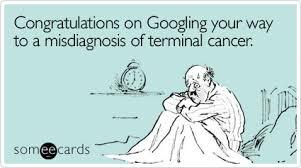 They warn you about Googling your symptoms, but when an aching pain on the side of my body did not want to go away, I became desperate. Having suffered from Ulcerative Colitis (wiki link if you’re keen to know what this is) since 1998 and lately Enteropathic Arthritis (another wiki link), I feared the worst! All the search results pointed to an enlarged spleen or some form of liver cancer. Eeeek! So I headed off to my Gastroenterologist who immediately did a battery of tests, trying to figure out what this odd pain was. I know a couple of people on my Twitter timeline and Facebook pages suffering from severe illnesses and as I sat waiting for my test results, I wondered how I was ever going to face another complication from my bowel disease. A pulled stomach muscle? Huh? When the test results came back, and my Doc did one last check, he concluded that yes, I am having another inflammation attack but it wasn’t anything serious. Somehow I’d managed to pull a muscle on my lower left side just under my ribs and that’s what was causing the pain. How the hell? This entry was posted in My Body, My Fears, My Illness and tagged diagnosis, enteropathic arthritis, google, pulled muscle, rest, ribs, time off, time out, ulcerative colitis by Bo. Bookmark the permalink. Ouch! sounds painful, hope you are feeling better this week!! I don’t bother with Google anymore, scares me shitless! LOL!